This exhibition, drawn from the Gallery’s permanent collection, was inspired by a recent acquisition. Earlier in 2018 the Friends of the Tatham Art Gallery purchased a work by Bronwen Findlay from her exhibition in Johannesburg, for the Gallery’s collection. Bronwen is well-known for her unusual depictions of flowers in paint and prints. Other works on this exhibition include paintings and objects with flower themes from other South African and international artists. A new exhibition, selected from the largest works in the Gallery’s permanent collection, will be on display in the Main Gallery from Friday 7 December. There will be no official opening. Some of these works are too large for our store rooms and spend their days stacked in passages. It is time to give them air and let them speak their powerful messages. As we were looking at size in the first place, we did not consciously choose a theme or country of origin. During the process of selection we came across surprizing juxtapositions, and the exhibition gathered a momentum of its own. Visitors are challenged to find their own meaning and context in this display. The exhibition will run over the Christmas period, and end on 17 February 2019. This eclectic display of British, French and South African art works spans more than three centuries. Each art work has its own story to tell. Still Life with Omega Flowers (1919), by the English artist Roger Fry, was purchased in London for the Gallery’s collection in 1985. This painting extends the Gallery’s collection of British Post-Impressionist art works. Between 1908 and 1912 the British artist, William Orpen, and his family spent their summers at Howth, a village just north of Dublin in Ireland. Howth Head offers spectacular views over the Irish Sea. A bell tent would be erected for shelter and it was here that Orpen started painting in the open air. He developed a distinctive plein-air style that featured figures composed of touches of colour with no drawn outline, influenced by the French Impressionists. In the Tent, Howth of 1912 is one of a series of paintings from this period. The oldest and largest painting in this exhibition was painted by the Dutch artist, Jan Wijnants, in about 1670 ((above) Jan Wijnants, Wooded Landscape (c.1670), oil on canvas). The painting migrated back and forth across the Atlantic Ocean a number of times. In the early twentieth century a Mr Berlein from Johannesburg bought the painting at an auction in Paris for his wife. In about 1970 the painting was sold to Mrs Joice Nicholson. She sent the painting overseas for the December 1978 auction at Christies in London. It did not realize the expected price, and was sent back to the Nicholsons at St Michaels-on-Sea, Natal. In 1983 Mr Nicholson donated the painting to the Tatham Art Gallery in memory of his deceased wife. Judith Mason Attwood’s powerful mixed media triptych, From the Tombs of the Pharaohs of Jo’burg (1986), is a recent addition to this exhibition. According to the artist, the subject matter is meant to be neither an anti- capitalist nor pro-industrial monument. The assemblage symbolises a variety of men from Zulu to San who sought work on the Reef, with the gilded Tiger-fish of progress devouring the pastoral buck. This display, selected from the Gallery’s permanent collection, features landscape paintings by South African artists. Any two or more paintings in this display invite comparison and discussion. The paintings are as varied as the South African Landscape, and show many different ways in which artists engage with their environment. To a greater or lesser degree, all of them deal with abstraction. Some images are easily readable as particular places while others merely suggest space. All retain an abiding respect for the two-dimensionality of the painted surface. Landscape is used as a springboard for diverse personal exploration. There are challenges of suggesting spaces with marks and colour; engaging the viewer in experiencing particular weather conditions and landscape formations; and inviting consideration of environmental issues. Many of the paintings depict people, sometimes starkly visible and at other times almost dissolved in the landscape. Human figures are often completely absent from landscape paintings. When they do appear, they are often dominated by their surroundings. Figures can play various roles to enforce the artist’s view of the rural or urban environment. Images can range from detailed observation to simplification or even distortion, often to enhance a mood or express feelings. You are invited to ponder the depiction of figures in the paintings in the display. Jacob Hendrik Pierneef (1886-1957) is considered the iconic painter of the South African Landscape. Of Dutch parentage, he was born in South Africa but also spent time living in Europe, where he came into contact with broader contemporary ideas about art making. The work of Dutch artist and theorist Willem van Konijnenburg inspired Pierneef to greater abstraction of nature. Pierneef spent most of his life in the Transvaal, but travelled widely around South Africa and Namibia. In 1951 he received an honorary doctorate from the University of Natal. Part of the current display is a historic overview of 20th century South African commercial potteries. These potteries, of which few still operate, played an important part in South African society between the two World Wars. Viewers interested in the history of design will find a fascinating fusion of European and African influences. On the right hand side as you enter, ceramics from a number of historical South African commercial studios are displayed in chronological order. Information about these studios is posted on the inner walls of the cabinets. Look out for indigenous imagery that contextualizes these South African ceramics. On the left hand side of the room you will see hand-made ceramic vessels by well-known individual South African artists. Note that some male potters were influenced by traditional female Zulu potters. This new display is a juxtaposition of liquid-holding containers from the Gallery’s permanent collection. They represent different cultures, purposes, designs and materials. 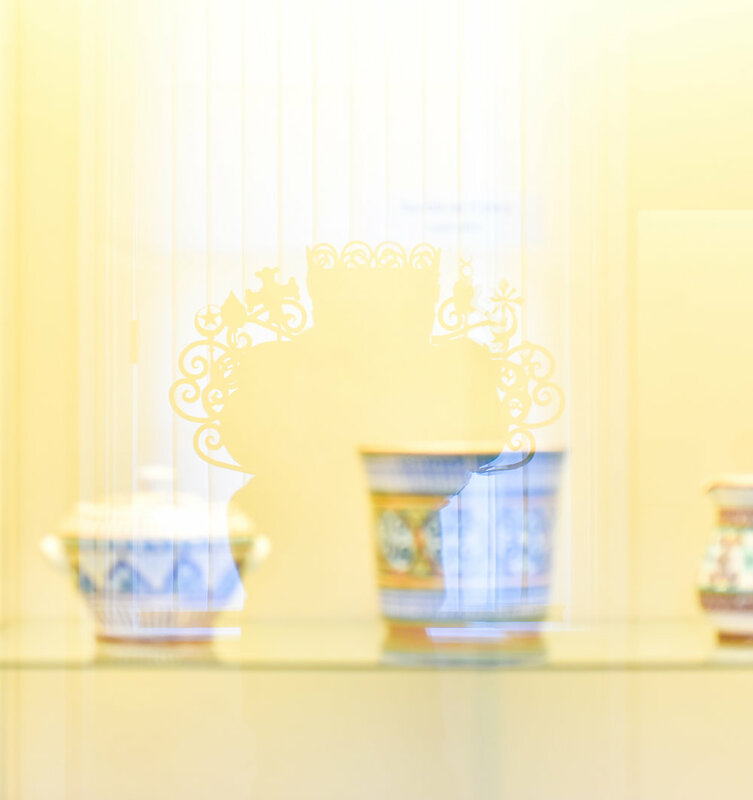 Porcelain originated in the East and has been widely used to hold hot liquids. René Lalique (1860-1945) was a famous French designer of glass containers, often used as vases. The Nala and Magwaza families are renowned for their exquisitely decorated burnished earthenware forms, based on traditional Zulu beer vessels. Click here for Fabulous Picture Show 2018! This exhibition presents a collaboration between Muzi Ndlela and Sibusiso Mvelase, who both had the unique opportunity of attending a special art course at the University of KwaZulu-Natal this year. Their themes revolve around ancestral beliefs. The artists are proud to showcase these recent works after being introduced to various elements in art making including art theory at the Centre for Visual Art in Pietermaritzburg.They will be artists-in-residence fromTuesday 16 to Friday 19 October 2018. Hussein Salim, originally from Sudan, is a local resident and practising artist. This exhibition is a mosaic of deeply reflective and meditative acrylic paintings often on recycled paper. The artist uses colour, form, symbolism and carefully considered layering to create dynamic images that are immersed in his African and Islamic heritage. Workshop with Hussein Salim Tuesday 4 September and Tuesday 11 September from 09h30 to 12h30. The artist will conduct two workshops where he will share his art making experiences and skills and show participants how to make magic with basic, inexpensive and recycled materials. The annual KwaZulu-Natal Midlands Matric Art Exhibition shows art works mainly made by the previous year’s Matric art students from local schools. Young and old enjoy this display and learn about new methods and ideas from our innovative and enthusiastic youth. On display will be drawings, paintings, installations, prints, digital images, three-dimensional works and creations that sometimes defy traditional description. This healthy youthful search for innovation makes a visit to the exhibition an exciting experience. This exhibition is the result of an enthusiastic response from our local hard-working Matric Art Teachers. Art students have to be challenged, encouraged and nurtured. In many cases the art teacher becomes aware of the student’s personal struggles in life. For these teachers to find free time in order to create their work is a tough challenge, and we salute their creativity and perseverance. Valerie Leigh was Curator of the Tatham Art Gallery between 1967 and 1974. Her major contribution was expanding the permanent collection with acquisitions of art works, including ceramics, by South African artists. She later worked as a curator at the South African National Gallery in Cape Town. As Art Co-ordinator for the KwaZulu-Natal Provincial Museum Service between 1984 and 1997, she actively promoted the work of marginalised artists and crafters in the province. Dr Leigh is an artist in her own right. This exhibition comprises works by Valerie Leigh in the Gallery’s permanent collection. Beth Diane Armstrong highlights the use of sculpture to explore different expressions of density and looseness in relation to scale, structure, materiality, space, representation, and process. The title, in perpetuum, suggests something which is ongoing and everlasting. Armstrong applies the term to negotiating an unremitting pull between the desire to be entirely overwhelmed and subsumed by a sculpture and the drive to resolve and contain the idiosyncratic challenges posed by it. Armstrong’s process is the translation of fleeting, abstract experiences into the permanence of a physically demanding material such as steel. Armstrong’s mastery of the medium is captured in this body of work. It accentuates her meticulous processes, her attention to detail and her astounding ability to effortlessly switch between intricate smaller works and imposing large-scale masses. Themes and motifs are drawn from her entire career as a sculptor and mark a full-circle return to where it began, having received her Masters in Fine Art from Rhodes University in 2010. As a whole, in perpetuum presents Armstrong’s work as a continuously self-generating system driven by the interplay between density and looseness. The five artists featured in this exhibition are part of an ongoing local peer mentoring and discussion group. All are former students or lecturers connected to the Centre for Visual Art at the local campus of the University of KwaZulu-Natal. The artists’ works are connected in the first instance by the immediacy of communicating via marks on a canvas or other support. The works, although based in observation, display differing degrees of realism, so as to amplify the interpretive possibilities of the subject. This award-winning display comprises stamps, post-cards, and other philatelic memorabilia, assembled by members of the Maritzburg Philatelic Society. Various themes celebrate the history of Pietermaritzburg from the arrival of the Voortrekkers to the present day. These include war, early transport, architecture, sport and people. School groups are warmly invited to visit this highly educational display. Bookings are preferred. This small display in the Schreiner Gallery represents a large contribution to artistic production by past and present students and staff of the Centre for Visual Arts (CVA) at the University of KwaZulu-Natal. There has always been a strong link between the CVA and the Tatham Art Gallery, most of whose past and present curators were trained there. Over the years this art school has gained national and international reputations for excellence. This exhibition links up with the other ground floor displays, which are also dedicated to the art of KwaZulu-Natal.